Direct observational studies of platypus behavior are exceedingly difficult to undertake: the animals are active mainly at night, and spend most of their time either feeding underwater or resting in underground burrows. Accordingly, much of what is known about the species' movements, habits, and activity patterns has been gained through radio-tracking studies. By fitting animals with special miniature radio-transmitter tags, their location and behavior can be monitored in a consistent manner both during the day and at night. (males have bigger home ranges than females) and habitat productivity. Home-range size shrinks as waterways support more of the small organisms eaten by the platypus, presumably because the animals do not have to travel as far to find enough food. 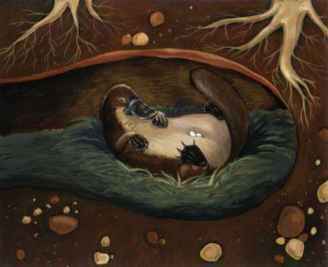 When a platypus is not feeding, it spends up to 17 hours a day resting in a dry, snug burrow located in a bank at the edge of the water. The animals' front toes are tipped with stout claws, and observations made in captivity have shown that a platypus is capable of digging a new burrow at the rate of around 1.5 ft (0.5 m) per hour. An adult without dependent offspring normally occupies several different burrows (up to about a dozen) within a period of a few weeks. By having numerous burrows scattered along the length of its home range, a platypus is always reasonably close to a safe refuge while feeding. The platypus rarely vocalizes but, when feeling threatened, the animal can produce a high-pitched growl.